For over a century scientists and clinicians have proposed mechanisms to explain the phenomenon associated with hypnosis. The key theories of hypnosis, historical and current, are presented here. For the more recent models some knowledge of cognitive psychology is useful. Within psychology most current models of how the mind works what is termed 'executive function' make use of the concept of an executive control system (Norman & Shallice, 1980, 1986) (a description of what is meant by executive control is given on this page). A key debate in hypnosis throughout the twentieth century has been between 'state' vs. 'non-state' theories, properties of these types of theories are given below. Recently attempts have been made to integrate findings from both of these positions. Hypnotic phenomenon are produced through a dissociation of high level control systems. An extension of social learning theory. How a participant expects suggestions to change their subjective experience lead to a change in experience, and can generate involuntary responses. A re-integration of dissociated experience and dissociated control theories. Hilgard's Neodissociation theory of hypnosis is a classic 'state' theory. It proposes that hypnotic phenomenon are produced through a dissociation within high level control systems. Essentially, the hypnotic induction is said to split the functioning of the executive control system (ECS) into different streams. Part of the ECS functions normally, but is unable to represent itself in conscious awareness due to the presence of an 'amnesic barrier'. Hypnotic suggestions act on the dissociated part of the ECS and the subject is aware of the results of the suggestions, but is not aware of the process by which they came about. Hilgard's theory was inspired by his experiments with the 'hidden observer' phenomenon whereby a 'hidden part' of the mind of a subject experiencing hypnotic pain relief could be encouraged to elicit reports of the 'true' pain experience. The idea that the hidden observer demonstrates the presence of consicous and unconscious executive systems in hypnosis is a controversial notion (e.g Heap et al, 2004; Kirsch & Lynn, 1998). An illustration of Higard's hierarchical model of cognitive control is shown above (Hilgard, 1973). Woody & Sadler (2008) note that Hilgards ideas of an 'amnesic barrier' and the 'hidden observer' do not sit comfortably with cognitive or physiological psychological models. Neurophysiological theories of hypnosis propose that high hypnotisables have better executive function than low hypnotisables and can thus deploy their attention in different ways. Gruzelier (1998) presented a model of hypnosis characterised by changes in brain function. The process of hypnosis is described in three stages, each with its own characteristic pattern of brain activity. Gruzelier's neurophysiological account emphasises that changes in the way the attentional control system operates in hynosis renders the subject more suggestible. Gruzelier's model finds some support from behavioural and neurophysiological evidence and complements other state-like accounts of hypnotic functioning. However, interpretation of much of the evidence critical to such models is questioned by sociocognitive theorists (e.g. Wagstaff, 2004). Crucially though, the predictions of enhanced executive skills in high hypnotizables are testable. The dissociated experience theory of hypnosis argues that high hypnotisables execute hypnotic responses voluntarily, but that this effort is not monitored correctly and is dissociated from conscious awareness. Social-cognitive theories form the 'non-state' end of the 'state-nonstate debate'. State theories argue that processes such as 'repression' or 'dissociation' operate when subjects are given a suggestion, whereas non-state theories view subjects as active "doers" and observe the suggested effect as an enactment rather than a happening (Spanos et al, 1980). Social-cognitive theory of hypnosis argues that the experience of effortlessness in hypnosis results from participant's motivated tendencies to interpret hypnotic suggestions as not requiring active planning and effort (i.e. the experience of effortlessness stems from an attributional error). The attribution of volition depends on the kind of response-set which has been put into place, and if a hypnotic response-set is in place then volition is attributed externally. Put simply, effortlessness in hypnosis comes about when individuals expect things to be effortless, and 'decide' (more or less consciously) to respond along with suggestions. Also know variously as a 'cognitive-behavioural perspective' (Spanos & Chaves, 1989), and a 'social-psychological interpretation' (Spanos, 1986). Spanos believed that attitudes, beliefs, imaginings, attributions and expectancies all shaped hypnotic phenomena. "Spanos (1991) used the construct of strategic role enactment to explain how individuals transform imaginings, thoughts, and feelings into experiences and behaviours that are consistent with their ideas of how a good hypnotic subject should respond to the overall hypnotic context and specific suggestions in particular. How subjects construe the hypnotic role is thus a key determinant of hypnotic responsiveness." "The response of high hypnotisables to suggestions for amnesia, analgesia, and so on, are often not what they seem, and ... such responses in fact reflect mundane social-cognitive processes such as compliance-induced reporting biases, alterations in attentional focus, and misattribution of experience, rather than such special processes as dissociation" (Spanos & Coe, 1992). According to Response Expectancy Theory (Kirsch, 1985) "expectancies can directly alter our subjective experience of internal states. In addition, when we expect a particular outcome we sometimes unwittingly behave so as to produce that outcome (Kirsch, 1985, 1997, Kirsch & Lynn, 1999). For instance, when people take the phony cognition-enhancing drug R273 they tend to expect it to improve their alertness, so they engeg in more effortful monitoring but misattribute their improved performance to R273 (Clifasefi et al, 2007)" (Michael, Garry, & Kirsch, 2012). Kirsch and Lynn (1997) propose that subjects in a hypnotic situation have generalized response expectancy (a belief) that they will follow the hypnotists's instructions and will produce behaviours that are experienced as involuntary. A consequence of this is that these subjects attribute hypnotic responses to external causes (i.e. the hypnotist) and experience them as involuntary. According to this theory hypnotic responses are initiated by the same mechanisms as voluntary responses, the difference is in how the behaviours are experienced. A general theoretical framework for understanding human social behaviour. Cold control theory of hypnosis considers the distinction between control and awareness in terms of Rosenthal's 21 HOT (higher order thought) theory. According to Rosenthal we are conscious of mental states by having thoughts about those states. A thought about being in a mental state is a second-order thought (SOT), because it is a mental state about a mental state (e.g. 'I see that the cat is black'). Third-order thoughts (TOTs) are also possible, by becoming aware of having an SOT (e.g. 'I am aware that the cat I am seeing is black'). The cold control theory of hypnosis states that a successful response to hypnotic suggestions can be achieved by forming an intention to perform the action or cognitive activity required, without forming the HOTs about intending that action that would normally accompany reflective performance of the action. Placing emphasis on the nature of perception and consciousness, Brown & Oakley (2004) incorporate ideas from both dissociated control and response set theories. They include the dissociated control theory concept that suggested responses may be facilitated by an inhibition of high-level attention, and the response-set idea that suggested involuntariness is an attribution about the causes of behaviour. Dissociated control theory of hypnosis (DCT) applies the Norman and Shallice model of executive control to explain hypnotic responding. The original version of the model focussed on a functional dissociation between executive control and lower subsystems of control. Woody & Bowers (1994) linked the theory to the Norman & Shallice mode. The DCT model proposes that when highly hypnotizable individuals are hypnotized the supervisory attentional system (SAS) has become functionally dissociated from the contention scheduling system (CS) - that is, these two levels cease to work together effectively. With the higher level control system partly disabled when high-hypnotizables are hypnotized, the individual is more dependent upon lower-level CS-based automatic processes. Contextual cues and suggestions from the hypnotist influence the contention scheduling system and affect the hypnotized person's experience directly. A number of studies have been conducted to test hypotheses generated by DCT and are reviewed in more detail in Jamieson & Woody (2007). One study used a difficult version of the Stroop task (difficult so that it should require strong SAS involvement) and found that highly susceptible individuals in hypnosis produced more errors than low hypnotizables - a result predicted by DCT. However, some other studies have found evidence for enhanced attentional control under hypnosis - contrary to what DCT would predict. Jamieson & Woody (2007) conclude that current data do not support a simple global shutdown of frontal functioning during hypnosis. 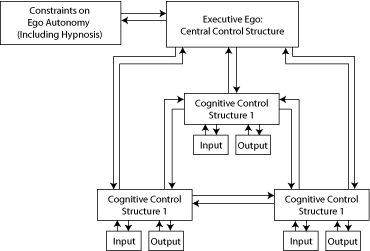 Woody & Sadler (2008) presented an integrative model of dissociative theories of hypnosis, shown above. and their chapter provides a comprehensive overview of this topic. In their model, a theory of dissociated experience involves the weakening of path c, and possibly of path e. A theory of dissociated control involves the weakening of path b, and possibly of path a. A theory of second-order dissociated control involves the weakening of path d.